The Experience Tour is for you! All ages need to come out during the last week of March 2018 and see first-hand how you can be a part of a $6 trillion industry! This is open to every citizen and you will have hands on experiences with code and robots. Tech experts from across the U.S. will be there to guide you. After the tour, you will have a chance to join a team of people like you who will be trained as developers using Apple Inc’s Swift language. Innovation Collective (IC) and the University of Idaho ? 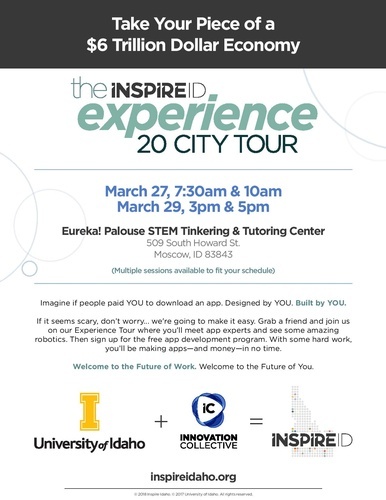 (U of I) are embarking on a 5-day, 20 city tour of Idaho to promote a rapid learning initiative called Inspire Idaho. The tour is called “The Experience Tour.” Over the course of the 5-day Experience Tour (March 26, 2017 - March 30, 2017) the Inspire Idaho team will demonstrate app development, programming, and motivate participants to join the rapidly growing, “app economy.” The Inspire Idaho team includes not only members of Innovation Collective, and the University of Idaho but also experts from around the country trained in app development in Apple Inc’s Swift programming language. 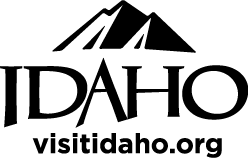 The tour is designed to generate awareness and promotion for the Inspire Idaho program which utilizes the land-grant extension offices as a means to provide workforce readiness training in the rapidly changing knowledge economy. The Inspire Idaho program launches its learning initiative later this spring with a first emphasis on app development. Each stop on the initial 20 city tour will include hands-on demos of Apple Inc’s Swift, Xcode and Playground products as well as the ability for participants to use the Apple iPad to program Sphero Robots and other interactive activities. Each stop on the Experience Tour will be open to the public and free of charge.